Construction waste being dumped in the quarry at Siġġiewi, which is private property. A move by Environment Minister José Herrera to take over an ‘abandoned’ quarry to solve the construction waste crisis has proved to be embarrassing. It turns out that the quarry is private property – the police were called in by its operators, and government officials were ejected from the site. This resulted in the government temporarily having to go back on its public announcement – trumpeted by the minister on TVM prime time – that it had found a new quarry for dumping construction waste. Space for inert waste has fast been running out on the island, leading to delays in the construction industry. In a press release issued at the end of last month, the government announced that following much consultation, including with the Planning and Environment and Resources Authorities, it had been decided WasteServ was to take over an “abandoned” quarry in Siġġiewi to manage it as a dumping site for construction waste. 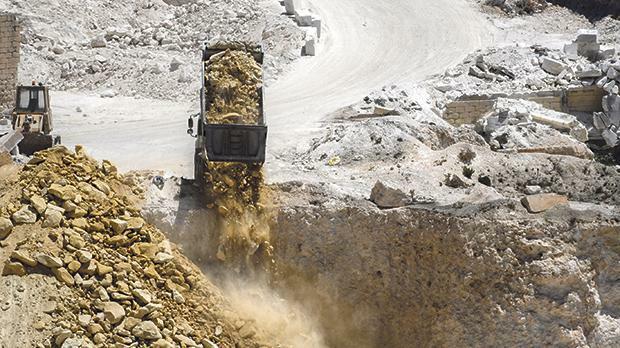 The government said the quarry, known as Tal-Magħluq, had been served with an enforcement notice by the Planning Authority because despite having stopped its activity years ago, the quarry had not been restored. Portraying the decision as a breakthrough in solving the waste crisis, Dr Herrera announced the date, July 2, by which the quarry was to start receiving inert waste from WasteServ. However, industry sources told The Sunday Times of Malta that all hell broke loose when Wasteserv officials were sent on site to start operations. The police were immediately called in as Lapsi Estates Limited and the new private operators, Tum Invest, got wind of the government’s actions. Wasteserv officials were asked to immediately leave the area, as the quarry was private property and the government had no right to carry out its plans. 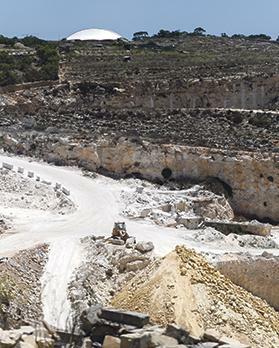 The Sunday Times of Malta is informed that the quarry has been the property of Lapsi Estates, owned by Alan, Brian and Maurice Mizzi, for decades. In 1994 it had to stop operations due to fears the quarrying was damaging the nearby Mnajdra and Ħaġar Qim prehistoric temples. However, after the site had lain disused for ages, the Mizzis recently came to a management agreement with Tum Invest, The Sunday Times of Malta is informed. Maurice Mizzi, one of the quarry owners, was in recent years made Guardian of Future Generations by Dr Herrera. In order to keep the embarrassing situation under wraps and avoid the story spreading, the ‘independent’ Environment and Resources Authority was ordered by the ministry to issue a permit for the new operator of the quarry – Silvan Fenech on behalf of Tum Invest – to start receiving waste instead of Wasteserv. Through this expedited permit, an abandoned site has been turned into a goldmine, potentially earning the quarry owners and operators millions from the fees charged to contractors for disposing of debris. Research conducted by The Sunday Times of Malta shows that the ERA issued the permit “in record time”. Tum Invest applied for the permit on July 3, a day after WasteServ was ordered out of the quarry by the police, and received it just three days later, on July 6. Industry sources said this was the fastest permit ever granted by the ERA. “No studies were conducted on whether the site should be used for such an activity,” one source said. The area is in fact in a very sensitive and highly protected zone due to its proximity to the Ħagar Qim and Mnajdra Temples – a Unesco World Heritage site. When contacted, a spokesman for the Environment Ministry admitted that WasteServ had to “retract” from the site as originally announced. In a reaction issued on Monday afternoon, the Environment Ministry denied that it had ordered the ERA to issue a permit to the quarry operator. The ERA, the ministry said, had issued the permit with "various" conditions related to emissions and waste disposal, storage, handling and acceptance, among others.